At our house, we love shrimp in just about any form–even my picky eaters are good with a big pile of steamed shrimp and cocktail sauce. But the closest we’ve come to a real shrimp boil is when someone else makes it for us when we go even further South for vacation every year. We live in Kentucky. Hardly a state where an Old Bay shrimp boil would be a common event. But oh, how I love it. And to make it simpler for all of us land-locked folks (or anyone who just doesn’t have time to fiddle with layering ingredients in a huge pot of boiling water) these Old Bay shrimp boil packets are the way to go. 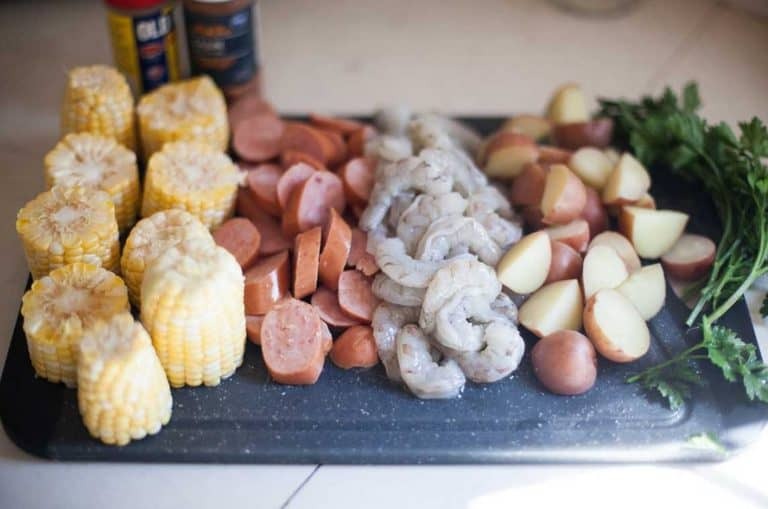 Your packets can be adjusted if you want to add or take out an ingredient your family isn’t a fan of or loves more than normal but the typical ingredients in a shrimp boil are sausage (I used smoked but some people like andouille), corn on the cob, shrimp, potatoes and seasonings. Here we are using Old Bay Seasoning and Cajun seasoning to boost the flavor. I wouldn’t recommend trying to use the seasoning packets or “drop in” shrimp boil flavorings you find in the spice aisle in this recipe. They aren’t made to be dumped directly on your food, but to flavor the water if you are boiling a traditional batch. Basically you’ll pass out from the spice if you dumped it right on your food. That’s really up to you. My version of these Old Bay shrimp boil packets serves 4 people and I used a pound of medium raw shrimp. I’ll confess it wasn’t enough to suit me. 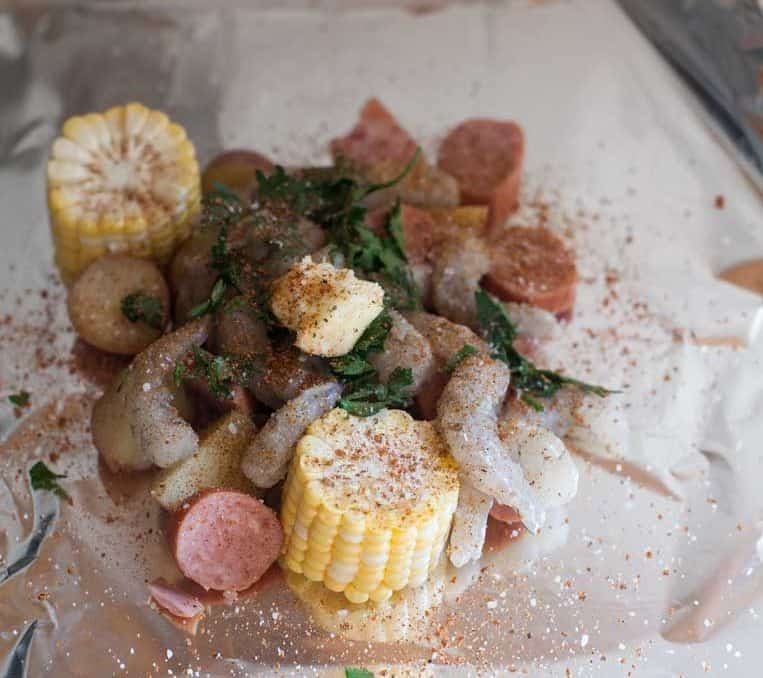 If you know you’ll have people who don’t like the other main ingredients (like the smoked sausage) then you may want to leave that out of their packets and add more shrimp. Just do what your budget will allow. Otherwise everyone will just have to get over it and eat whatever is in theirs. Side note: we’re using RAW shrimp here. Not cooked ones. If you buy them frozen, make sure the package says raw. They should be gray (that’s the normal color) and their flesh is sort of translucent. Cooked ones are bright pink, and their flesh will be white. 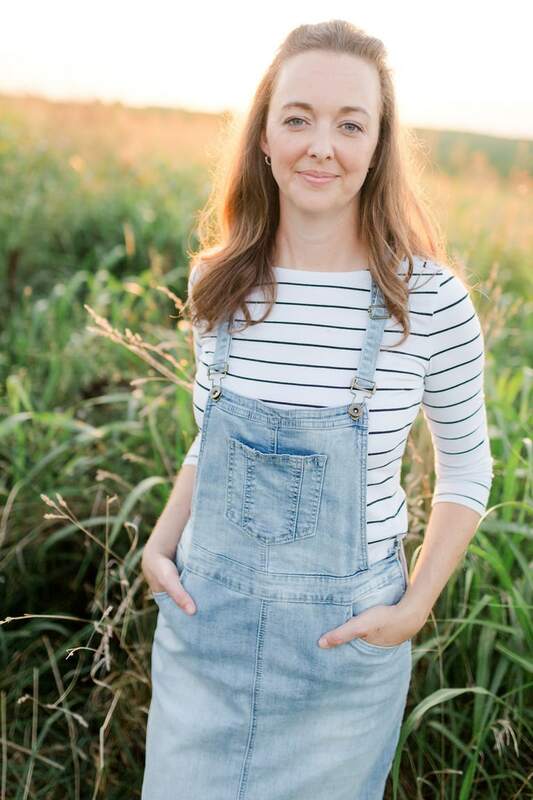 Here’s a good resource for picking shrimp at the grocery store if you need it. Some people get stumped by this but it couldn’t be simpler. You’ll just need some heavy duty aluminum foil. Tear off a sheet long enough to allow you to layer the ingredients inside and seal all the edges. Try to keep things in one layer and then put the shrimp on top. They are more delicate and will over cook and be tough if they spend too long in contact with the grill’s heat. 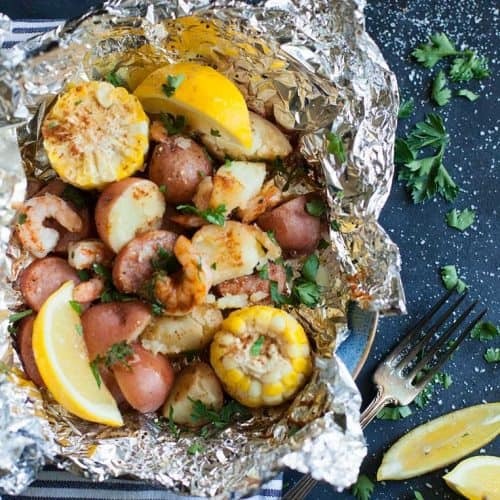 Just fold the foil over and tightly fold the other three sides closed so the steam says inside of your Old Bay shrimp boil packets. If you wanted to put your shrimp boil packets in the oven, it’s easy to do. Bake the sealed packets at 400 for 17 to 18 minutes and serve. No need for a grill at all if you don’t have one! -Pre-boiling the potatoes will help ensure that they are cooked through. I like baby red potatoes in this and I cut the largest ones that were about the size of a golf ball in half. If they were small I left them alone. -Do use both butter and olive oil here to get enough moisture in the packets. If you want to use all olive oil or all butter you can. 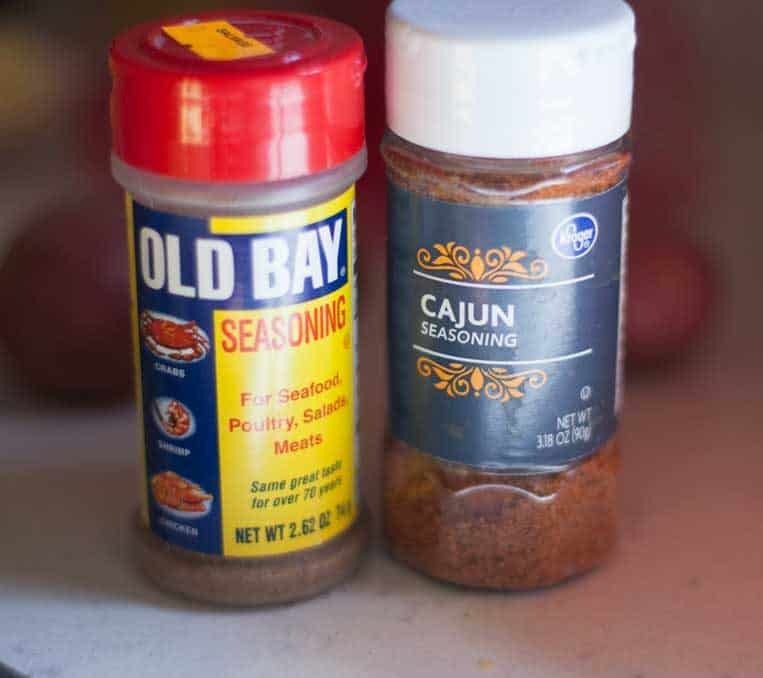 -You’ll find Old Bay seasoning and Cajun seasoning in your spice aisle. Neither one are spicy so if you want heat in your shrimp boil packets, add some cayenne pepper or red pepper flakes. These are great as-is for kids. -Feel free to use whatever sausage you like. I used traditional skinless smoked sausage but you can go with andouille, even chicken or turkey smoked sausage would be fine if you want to cut more calories. -Top each packet with a big squeeze of lemon juice, some fresh parsley and a little more salt if you need it. 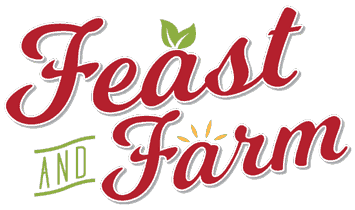 Serve your packets with some awesome homemade cole slaw or strawberry shortcake for dessert. 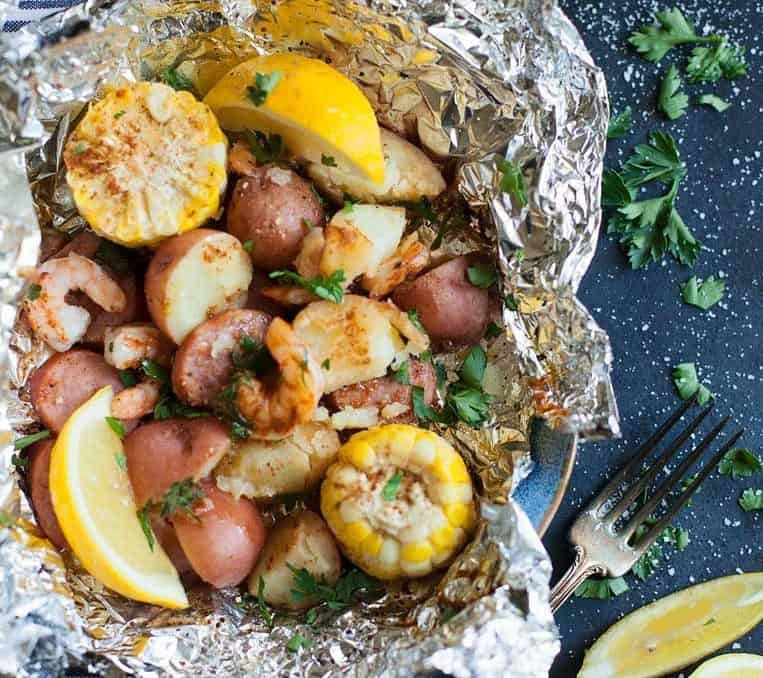 Everyone loves to open their own Old Bay shrimp boil packets sizzling with buttery, bold flavors. 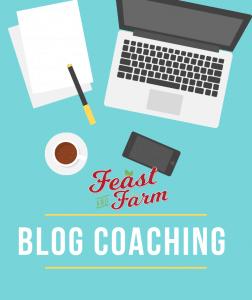 There's something inside for everyone and it's oven or grill friendly. Add the potatoes to a medium pot, cover with cold water and a big pinch of salt. Bring to a boil. Once the water boils, cook the potatoes for six minutes. Drain and set aside. Carefully cut the corn into 2-inch pieces. I do this by running a knife around the cob to score it but not cut it all the way through, then I bend it until it snaps. Set aside. Slice the smoked sausage in to 1/2" or thinner pieces. Set aside. Tear off 4 sheets of foil about 16 inches long. On one half, add the potatoes, corn, and smoked sausage. Pile the shrimp on top and add 1/4 of the Old Bay, Cajun seasoning,salt, butter and olive oil. Sprinkle with parsley and seal the side shut by folding them tightly. Grill over medium coals or flame 17-18 minutes. Serve hot with a squeeze of lemon, some more fresh parsley and a drizzle more olive oil if needed. 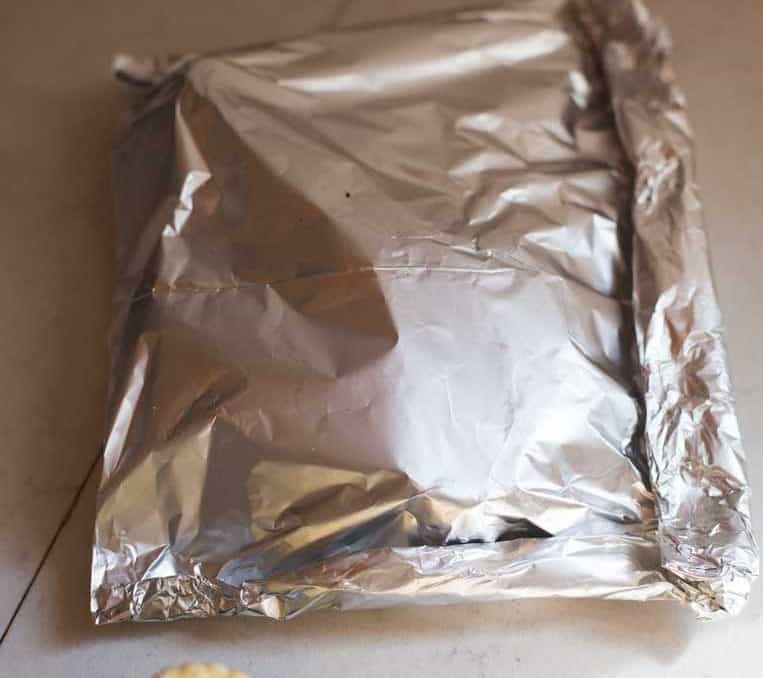 To bake, place the packets in the oven at 400 for 17-18 minutes.